GULF JOB INTERVIEW SAUDI RECRUITMENT. 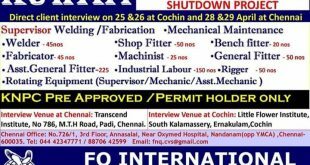 FREE RECRUITMENT CLIENT INTERVIEWS SHEDULED IN 2018.TECHNICIANS REQUIRED FOR SAUDI. cation for operational excellence and customer satisfaction. perience in aluminium can manufacturing company. experience in aluminium can manufacturing company. 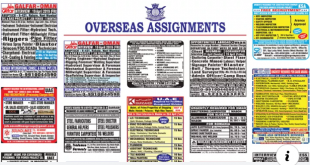 sir iam working in hyderabad.so iam unable to attend interviews in other places.can interviews can be done by telephone..
interviews are held in Hyderabad , basheerbagh…go for Travel point consultancy…. Do u have any GCC interview in Kozhikode. Did diploma & B.tech in electrical branch. Worked one year as a junior engineer in HPCL-VR in one year.& 6 months in APEPDCL.after that from last one year working k kumar raja projects pvt ltd in as project engineer in NAGPUR MSEDCL under project substations constructions & 33kv lines,Transformers erections. 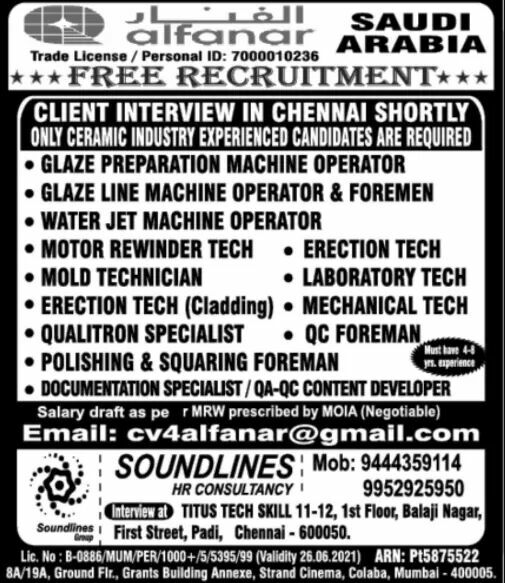 Is there any placements in Gulf.please inform me sir. Sir, I before working as a home appliances technician, in ministry of defense, jeddah. 8yrs. Wearhouse supervisor, 2yrs in jeddah also. So, I have a Saudi driving license also. So please inform me if any requirment is there. Technician or Even for driving I will go, plz inform me. Sir, i completed bsc.electronics. i am looking for a good job in gulf. I have no experience crtft. Sir,I completed degree in bsc mstcs and I have no experience. please tell me what is the course i should learn for getting good job in gulf countries. I have completed mba finance and I have experience as an accountant any job opportunities for ksa ? Sir this is taveer completed b. Pharmacy I have one year experience as a medical representative if you have any vacancies as a medical representative plz contact me..
Dear sir this is laxmikant konda I done MBA in marketing I have 1yr exp in marketing field now I helping my dad in my family business which is that fast-food center. Now I looking job at gulf countries please let me know sir how can I get good job there.which course is beter to me getting a job there. I am find job on Web Development. Hello sir good morning narsingh here I have 20year experience in oil field in gulf as a hot and cold insulation supervisor for pipe line tank vessels ect. So do you have any chance for me.? Hello sir myself Jagdish pandey I am searching job in dubai in any brand as a sales exicutive can you help me. I am in dehradun.and recently working in Raymond as a fashion consultant. Raymond is a best formal brand in india. Sir do u any interview to be held in mumbai or delhi for retail field.I am saudi return n have 5yr experience in this field.I am Mba graduate .plz look into it .Mine whatsapp and contact no is 8368090907.plz do inform me or call me via no given.